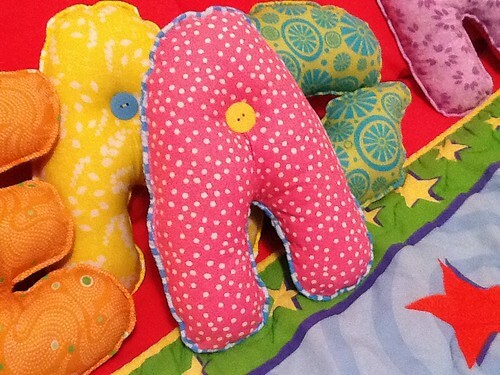 Rainbow Letter Pillows – Crazy for D.I.Y. August 2, 2011 October 27, 2016 • Crazy for D.I.Y. Who doesn’t love rainbows right? 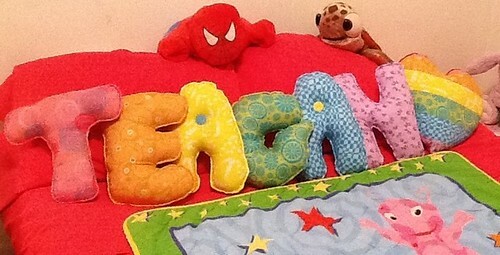 I wanted to sew Teagan’s name into a rainbow with each letter a different color and the heart pillow with pink & white poka dot fabric. On the back of each letter is the same pink & white poka dot fabric. She just loves pink! I figured because of the size of the pillows in the pattern, I could get away with buy the Joanns quilted squares that are 18×18″ for each letter and still be able to sew custom piping with the left over fabric. The pattern does not include instruction on piping, it was my personal embellishment. I bought all the square when they were on sale $1 each. Then with my 40% coupon I got away with .69 cents a yard of cording for the piping. The pink & white poka dot fabric was $4/yd and I believe I only needed 3 yds total (depending on how many letters you need). McCall patterns were on sale for $2 (once in a blue moon) at Joanns. The filling is a basic polyester filling for crafts (about $4). Last but not least, the buttons were $2 for a bag of 30 blue/yellow. ♥: The heart was initially going to be all pink & white poka dots with a dark pink (pre-packaged) piping but my innovative BFF, April, had a genius idea of making a rainbow effect on the front side with the left over fabric from the letters. YAY! We had enough! Posted in SewingTagged custom, diy, Fabric, kid, letters, pillows, piping, rainbow, sewingBookmark the permalink. Great idea for the contrasting buttons on the A pillows! 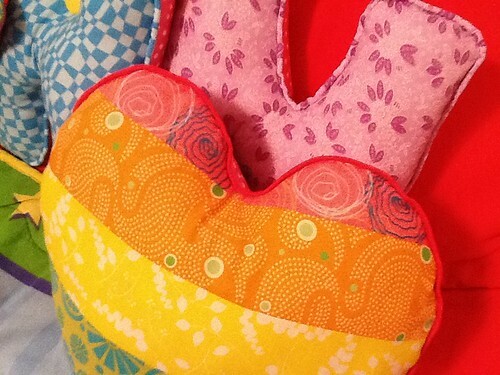 Pingback: Letter Pillows for a Sweet Baby Girl | Crazy for D.I.Y.